Fortunetelling Is A Sort Of Therapy For Stressed-Out Lebanese In a country where people have seen a lot of turbulence and welcome any information about what's coming next, fortunetellers offer some sense of predictability. In a country where people have seen a lot of turbulence and welcome any information about what's coming next, fortunetellers offer some sense of predictability. 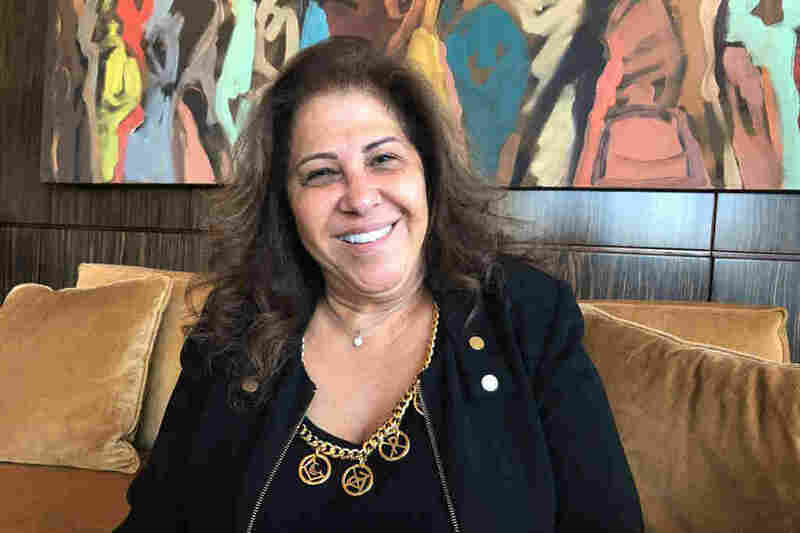 Leila Abdel Latif is a celebrity fortuneteller in Lebanon. Every New Year's Eve she appears on Lebanese television shows to predict the future of Lebanon and the wider world. The people of Lebanon have lived through generations of war and the perpetual sense of insecurity that comes with it, so the urge to know what's coming next may be especially strong. That's where fortunetellers come in. NPR's Ruth Sherlock in Beirut went to see what the future will hold. RUTH SHERLOCK, BYLINE: Every New Year's Eve, amid fireworks and celebrations, Lebanese switch on their TVs in search of clues for the coming year. SHERLOCK: There, Leila Abdel Latif, a voluptuous woman with bouffant hair, predicts the future of politicians, celebrities and nations. LEILA ABDEL LATIF: (Speaking Arabic). SHERLOCK: She says that this year, Lebanon, always on the brink of conflict, will be spared from war. SHERLOCK: But there will be an economic collapse and riots in Europe. Latif is far from the only soothsayer in Lebanon. SHERLOCK: Away from the spotlight, you can find fortunetellers in even the most remote little towns and villages. The practice seems to cross Lebanon's strict religious divides too. You can find respected clairvoyants in Christian and Muslim communities. In Jounieh, a Christian town north of Beirut, we step inside cafe La Tasse - The Cup in French. The place has lilac walls and a bright lime green ceiling. Clients wait nervously for the fortuneteller who's working in a small room at the back, behind a plastic door. UNIDENTIFIED PERSON #1: The first time. Yes. SHERLOCK: This woman asks us not to name her because her husband doesn't approve of this. UNIDENTIFIED PERSON #1: The men, they don't trust. My husband never believes in this. He feels that it's something stupid. SHERLOCK: But she says fortunetelling is incredibly popular among her female friends all over the country. UNIDENTIFIED PERSON #1: They like to see their future - really, many people - I don't know - like it's a fashion. SHERLOCK: Why do you think that is? UNIDENTIFIED PERSON #1: Because we have too much stress in Lebanon. SHERLOCK: She says it's a remedy for living in such a politically unpredictable place. These clues to the future, they can be comforting. UNIDENTIFIED PERSON #1: Yes, it's therapy. That's it. It's therapy. SHERLOCK: Hey, nice to meet you. SHERLOCK: The fortuneteller Helen Maalouf (ph) beckons us over. We sit crammed on a small couch with a client who introduces herself only as Mirna. UNIDENTIFIED PERSON #3: Mirna, Mirna. SHERLOCK: Mirna has been coming here for 15 years. She says Maalouf once correctly warned her that her husband had heart problems, saving his life. SHERLOCK: Christian crosses hang on the walls of Maalouf's cafe. Though some religious leaders condemn fortunetelling as a dark art, Maalouf believes it's actually a way of coming closer to God. SHERLOCK: She claims her clairvoyance started with the apparition of Saint Charbel, a Lebanese Christian figure known for his capacity to heal. My colleague Lama al-Arian interprets. LAMA AL-ARIAN, BYLINE: She says, "I pray more than most people. Every time before I'm about to tell somebody's fortune, I do the cross. I encourage people to pray, as well." And she said, "there are some priests and imams who do criticize my work, but..."
AL-ARIAN: "I tell them to pray." SHERLOCK: In the end, she says, her ability to see the future shows her connection to God. SHERLOCK: Maalouf's assistant brings a tray of porcelain cups filled with thick Arabic coffee. A bittersweet smell of cardamom rises in the air. SHERLOCK: After we drink, Maalouf turns my empty cup upside down and peers inside where the coffee grounds have formed a pattern. She looks at me. MAALOUF: (Foreign language spoken) Paul. AL-ARIAN: She said, "who's Paul?" SHERLOCK: She guesses the name of my boyfriend. AL-ARIAN: She's saying, "he loves you, but sometimes you guys drive each other crazy." SHERLOCK: In all, she predicts happy things. Lama will soon find a new love, and our work will lead to many big scoops. Is she right? Only the future will tell. Ruth Sherlock, NPR News, Jounieh.